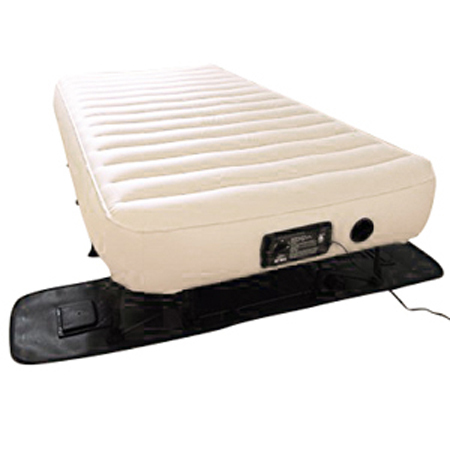 Compared to other brands, the main thing Aerobed inflatable beds have going for them is their price-quality ratio. They’re not the best portable beds out there by any stretch of the imagination, but they offer more than enough at a very reasonable price. It’s not easy competing with all the SoundAsleeps, Instas and Colemans out there, but Aerobed is doing a bang up job so far. And the Classic Double-high version, available in king and queen size, is no exception. So, they won’t be winning any best or top-rated air mattress awards anytime soon, but they’re good at what they do, and that’s embodying the business policy their manufacturer is pushing forward. Enough small talk, let’s see how it was rated it our latest update and why it’s placed second in the top 3 Aerobeds. 4 Who should get this mattress? Who should get this mattress? We’d say anybody who needs a good-quality portable bed on a budget. It won’t have all the bells and whistles of, let’ say, the Sound Asleep Dream Series, but it’ll get the job done without nuking your budget. It’s the runner up in our Aerobed guide, only second to the Aerobed Premier. They’ve also spiced up the offer from their early beginnings by introducing revolutionary patented technologies from the get-go. We’re talking ultra fast inflation and deflation. We’ve already said in our aerobed air mattress reviews that their built-in pump inflates them in under a minute, and they have around 15 seconds of deflation time thanks to the patented quick-release valve. So, stay put and get ready for some fresh info. As we said before, this is a decent air mattress for the price. It’s far from being the best portable bed in the world, or even best Aerobed, but It’ll get you where you need to go. It’s not made as your main bed, as users give it about 6 months under those circumstances, and our tests corroborate that opinion. You want it as your guest or back-up bed, and that’s about all it can do perfectly. It’s pretty comfortable, doesn’t slide around and keeps the sheets in place. It inflates very quickly, doesn’t leak air and it’s easy to set up and store away. On the other hand, the pump is separate, not built-in, you have to deflate it manually, which is a pain, no matter how quick, the design is mediocre, and it’s not all that durable under heavy usage. Bottom line – we get what we pay for. It’s a solid mattress from Aerobed with affordable price tag. Not bad, but not great – good value for money. Currently the top-rated Aerobed, with the Premier breathing down it’s neck in the few latest updates. It’s our estimate that the next in-house testing might just bring a change at the top. We hope this review helps you out. We’ll complement it with some new and exciting test results soon enough.